NVIDIA has just released a new set of graphics drivers in beta version for GeForce 6, 7, 8, 9, 100, and 200-series desktop GPUs and ION GPUs. This driver also installs PhysX runtimes 9.09.0428. OpenGL Extensions: 183 (on my GTS 250) or 184 (on a GTX 280). See the ForceWare 190.15 OpenGL Extensions List for more details. Adds support for CUDA 2.3 for improved performance in GPU Computing applications. Adds a new user-controlled power management setting for GeForce 9-series and later graphics cards. This option allows users to set a performance level for each DirectX or OpenGL application. Only for Vista and Seven. Many NVIDIA graphics cards support multiple performance levels so that the PC can save power when full graphics performance is not required. To provide more control over these power management capabilities, NVIDIA has added the Power Management Mode control. The control consists of two settings: Adaptive and Prefer Maximum Performance. The upcoming CPU-Z 1.52 displays the different performance levels in the Graphics tab. 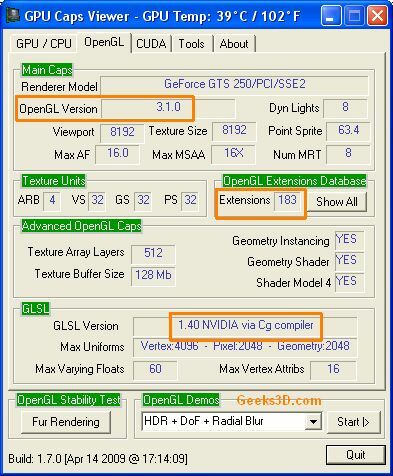 Which OpenGL extension present only for GTX 280? As NVIDIA OpenGL documentation is outdated a bit. The GTX 280 has the GL_NV_transform_feedback2 in more.